Get your logo out there on this quality Primary Care Kit for giveaways at a cheap cost. antiseptic swabs and a first aid instruction folder. Fully refillable first aid kit. 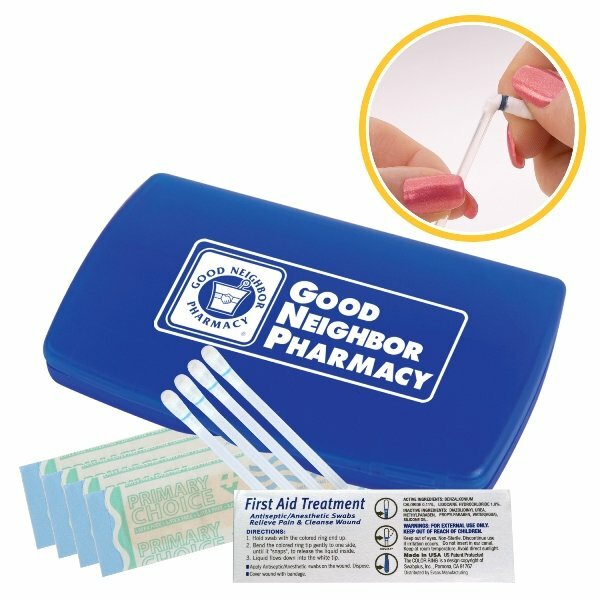 The Primary Care First Aid Kit is 4 1/8" w x 2 9/16" h x 1/2" thick. Rush Production is available in seven case colors. Normal delivery from date of order is 2-3 weeks. Price includes a one color imprint top side in area 3 1/2" w x 1 3/4" h.
Optional imprint on back is printed in an area 3 1/2" w x 1 3/4" h.